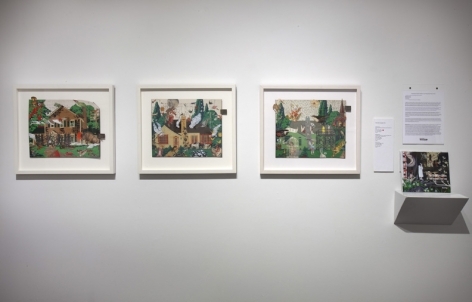 In conjunction with SGCI 2012, JONATHAN FERRARA GALLERY is proud to announce a group exhibition featuring copper plate etchings by renowned Chicago artist Tony Fitzpatrick, mixed media collage by Michael Pajon, and color aquatints by Catherine Brooks. Chicago-born TONY FITZPATRICK began his career in New York in the 1980s, spending much of his time in Washington Square Park and selling drawings on the sidewalk. Keith Haring and Jean-Michel Basquiat were among early supporters, buying his art and introducing Tony to New York galleries. 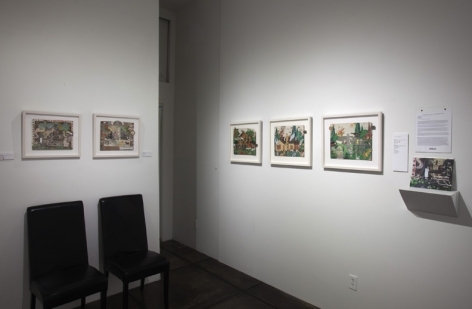 Tony has since had work shown in galleries in Chicago, New York, Los Angeles, and London. In September 2007 Tony was awarded a solo show at MOMA’s PS1, and in May 2008 a 10-year retrospective titled The Wonder, Portraits of a Remembered City opened at The Chicago Cultural Center. 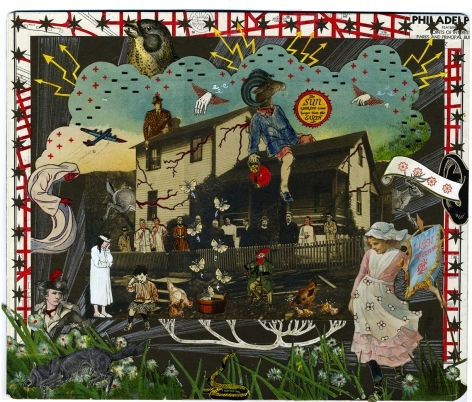 His artwork has been used on several album covers, including The Neville Brothers’ Yellow Moon and Steve Earle’s Washington Square Serenade. 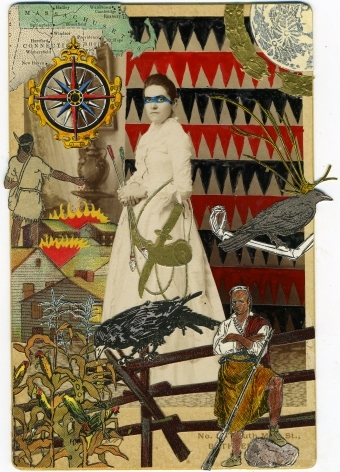 Fitzpatrick's art typically blends cartoon-like drawings and found-images, such as baseball cards and matchbooks, with poetic or narrative description. His main subjects have been Chicago, New Orleans and his most recent Hobo Series, based upon the Hobo Sign Language of the 1930s. Tony Fitzpatrick's works are in the collections of the Art Institute of Chicago, the Museum of Modern Art in New York, and the Museum of Contemporary Art, Miami. He is an accomplished poet and has published several books of his art and poetry, including The Hard Angels and The Neighborhood. As an actor he has appeared in numerous films, including Mad Dog and Glory, Philadelphia, Primal Fear, Married to the Mob, and U.S. Marshals. 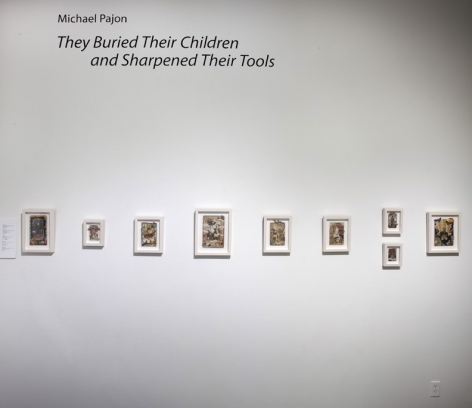 MICHAEL PAJON, also a Chicago native, worked as an assistant and studio manager to Tony Fitzpatrick after his graduation from the Art Institute of Chicago in 2003, where his focus was printmaking. As a child, Pajon taught himself to draw by copying the pages of Frank Miller’s Batman, Jim Lee’s X-Men, and EC comic reprints. He had also developed a habit of collecting not only comics, but old magazines and things that most would deem trash. These early habits inform his current series of mixed media assemblages- created from bits and pieces he has accumulated from alleys, junkshops, and thrift stores, slicing up old children’s book covers and rearranging their innards into disjointed narratives. In 2009 Pajon left Chicago and currently resides in New Orleans. 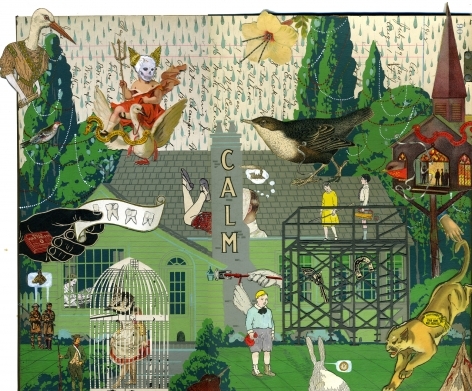 MICHAEL PAJON attended the School of the Art Institute of Chicago, graduating in 2003 with a focus in printmaking. Eventually gravitating to the graphic nature of the medium that closely resembled the comics he loved, he worked closely as an assistant/ studio manager to renowned artist Tony Fitzpatrick. 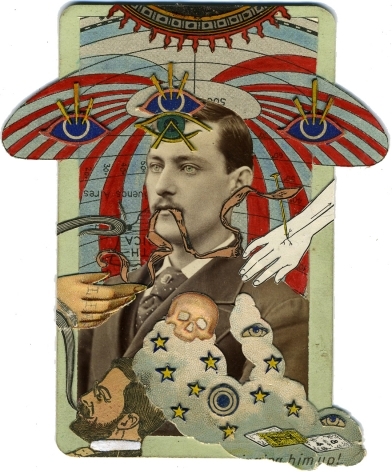 During this time he started making assemblages of the bits and pieces he had accumulated from alleys, junkshops, and thrift stores, slicing up old children's book covers and rearranging their innards into disjointed tales of Americana. 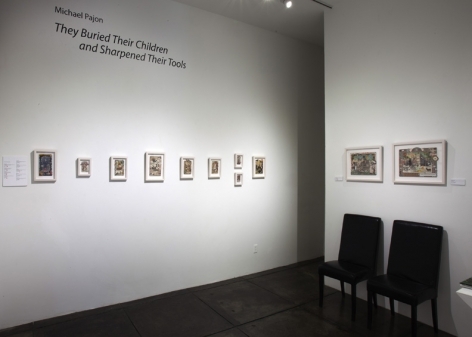 Pajon's work has been exhibited in various venues worldwide, including the Illinois State Museum, Chicago, IL; Chicago Cultural Center, Chicago, IL; Prospect 1.5 (curated by Dan Cameron), New Orleans, LA; Adam Baumgold Gallery, New York, NY; Nau-haus Art Space, Houston, TX, and Jonathan Ferrara Gallery, New Orleans, LA. His work has been shown in numerous art fairs including Nova Art Fair (Chicago, 2006), Bridge London (London, 2007), Aqua Art Fair (Miami, 2007), Next Art Fair (Chicago, 2008), the Texas Contemporary Art Fair (Houston, 2012), and VOLTA New York (2013). His work has been reviewed in Forbes, Where Magazine, Juxtapoz, ArtInfo, Artlyst, Gambit Weekly, New City, Artnet, Artslant, and Pelican Bomb. 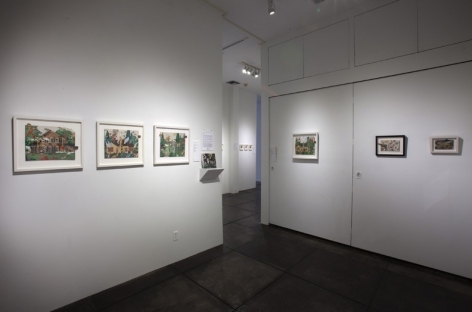 His works appear in numerous public and private collections including 21c Museum, Louisville, KY; the Francis H. Williams Collection in Wellesley, MA; Megan Koza Young of the Dishman Art Museum, Beaumont, TX; as well as prominent New Orleans collectors Thomas Coleman and Michael Wilkinson.